This is the first edition of a series regarding an 1898 Photo Book compiled by George S. Young. 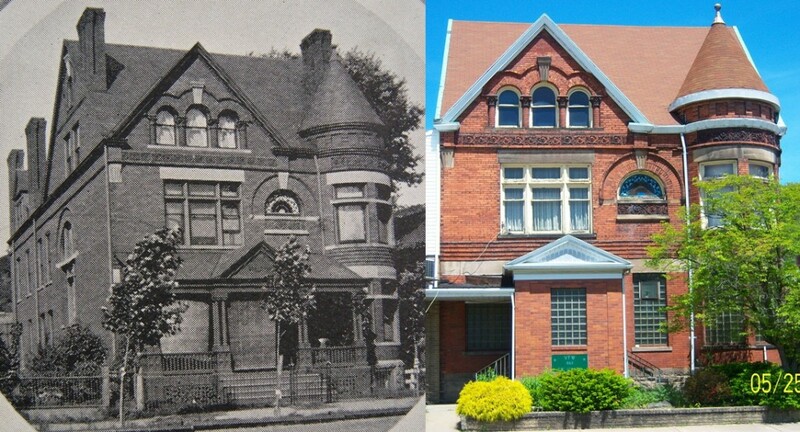 I’m attempting to provide a modern day photo of the same location for each photo taken 110 years ago. George S. Young’s family lived at 252 Union Ave. in the early 1900’s. This residence no longer exists, and was located behind the current Melody Manor which is at the corner of N. Mckean St. and Union Ave. As Chris Anthony stated in an earlier blog, some attempts were made to learn more about George S. Young. We discovered that he is buried Hillsboro, Oregon dying in 1945, at age 71. He and his wife lived in the nearby Yamhill County from 1920 on. 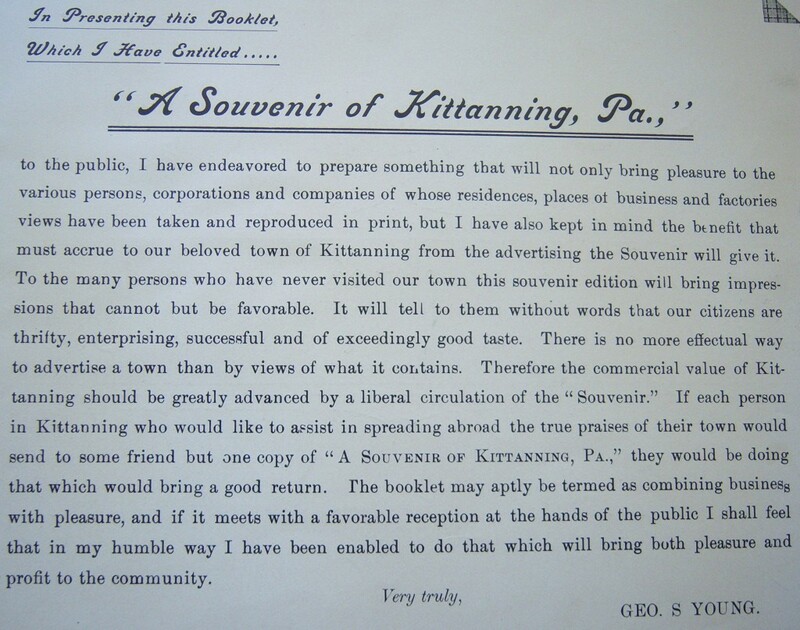 Possibly what led him away from Kittanning, was the occupation of salesman for Kodak. One can wonder what photos existed that weren’t published. Calls were made by me to a few Young’s in that Oregon area, but no connection was made. I did enjoy some great conversations though. Some of family still remained in the Kittanning and attempts are being made to locate them. I do have a family connection to George S. Young from the 1930’s. I had a great-aunt, Mary Elizabeth Harmon married to James Young, he was a brother to George S. Young. They resided at 145 Oak Ave. in 1931, and James Young had a daughter Margaret to a previous marriage. The search will continue and many photo treasures may be discovered. Ellermeyer Bros. Apartments are still in use today. Harry Ellermeyer in the early 1900’s was associated with the Hardware business in Kittanning, also having a Studebaker Dealership in the 1930’s on N. Mckean St. Brothers William and Charles Ellermeyer had a large meat market. They owned a large farm where the current Walmart is located, and it extended to the Roofner Plan in West Kittanning. Joe Bonner who lived in West Kittanning as a kid(1930’s), can remember them butchering the cows near the Roofner Plan. He recalls the Polish mothers coming and getting the blood for “Blood Pudding”. 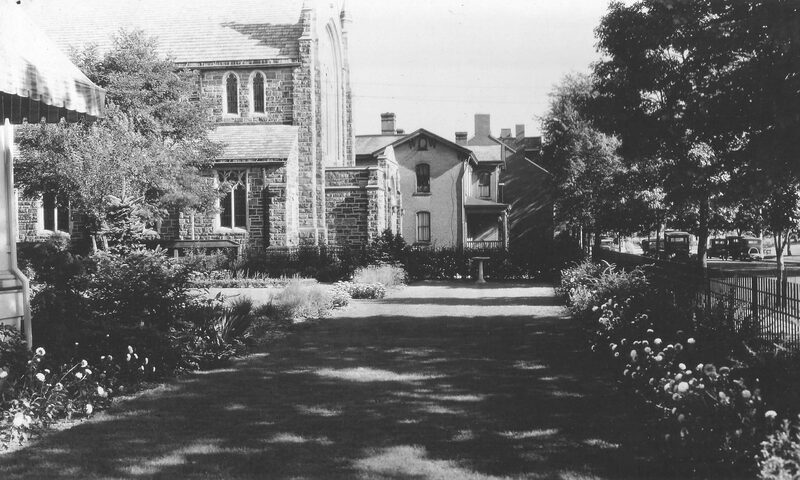 Before becoming the VFW this was the residence of Grier C. Orr when the photo was taken. Grier C. Orr was an attorney, and had an uncle Robert C. Grier that was on the United States Supreme Count. Later in the 1919 Polk Directory, John A. Fox resided here. He was associated with the Safe Deposit and Guaranty Bank(currently Citizen’s Bank). Later he was associated with Fox & Stone a Real Estate company, in Kittanning. 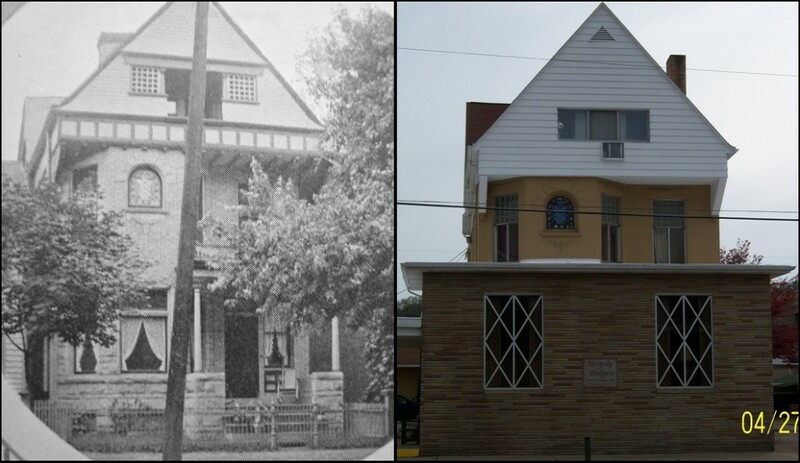 Formerly the home of Joseph Smith in 1898, this has served Kittanning as a funeral home for several year. Alonzo P. Merwin, Kennedy, Kennedy/Blodgett, and recently purchased by Snyder-Crissman. In 1898 this was the residence of Mrs. Mary A. Craig. Long known as the Craig Apartments, it is now occupied by Northwood Reality.